Cosmos Royce Top https://www.review-australia.com/au/cosmos-royce-top-black/RE19TW082.REBLK055.html Whether you are headed to the office or out for evening dinner with friends, this Cosmos Royce Top is an adaptable piece for all occasions. Decorated with a charming floral print, sleeveless design and a side tie which can be worn loose or tied in a bow depending on the occasion. Tuck it into a pair of high waisted pants or team with heels and a flared skirt for evenings out. Cosmos Royce Top is rated 5.0 out of 5 by 10. Rated 5 out of 5 by Sue14 from Soothing print and comfort fit ! I spilled coffee in my top at work and rushed in to the store to pick up a top to go with my black pants and jacket. I was in a rush and picked up a few tops to try but missed this one. I'm so glad that the lady at the store suggested me this and I liked I the moment I wore it. It is a non crush material and an easy wear for a hot and humid weather. Can be paired with a jacket or cardigan for winters. The fit will suit customers like me who like a loose fit around the tummy yet a short smart length .And it is absolutely value for money ! Rated 5 out of 5 by DeeQ from Chic and classic top I bought this top on a whim during a flash sale on the website and I'm so glad I did! I get compliments every time I wear it. 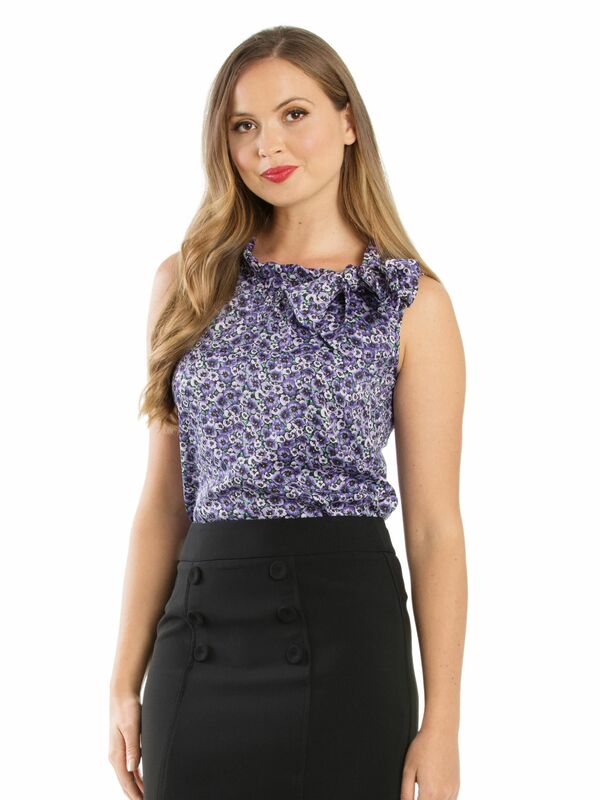 The purple is gorgeous and the style of the Royce top makes any outfit chic. I wear this with a skirt for work and then with jeans on weekends, so it's really versatile as well. I would say the fit is true to size. I couldn't recommend this top more highly! Rated 5 out of 5 by KazB from Pretty Purple I bought this new Royce design recently and absolutely love the purple floral design. This would be about the fifth Royce top I have purchased - they are great for work worn with a black skirt, very comfortable and floaty, and their timeless design lasts over a number of seasons. I would definitely recommend! Rated 5 out of 5 by KateD from Very versatile cute top I love this violet top and how well cut it is around the arms. It sits well and the ties look great in a bow or loose. Rated 5 out of 5 by wicky13 from Great top The Cosmos Royce Top is beautiful with the prettiest colours on it. Well fitting and suitable for all occasions. Rated 5 out of 5 by Jess_Q from Beautiful floral top I brought this via 'click and collect' at my local Review a week ago. It fits beautifully and is a lovely print.